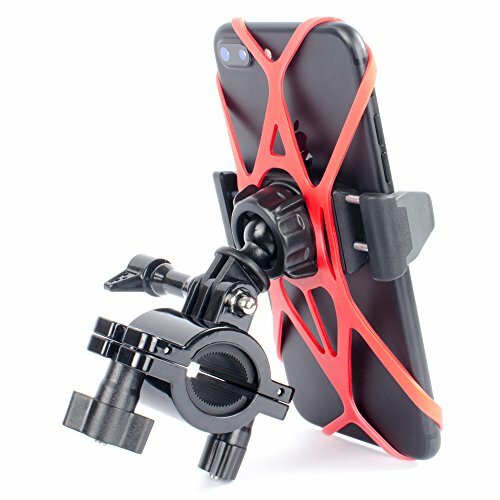 What to look for when buying a bike phone mount? Is having your phone with you when you are cycling an important factor for you to take into consideration when purchasing cycling equipment? Having your phone accessible and visible while cycling can be helpful in many ways, including GPS, maps, following routes, encouragement, listening to music, routes and to help you find fellow cyclists. If you think that you would benefit from one, many or all of these advantages, then finding a suitable phone mount can be a seemingly endless mission, but look no further; we have created a list of what we consider to be the 8 best bike phone mounts around. This bike phone mount is considered to be universal so is compatible with all leading phone brands, including iPhones and Samsung’s, so long as the phone in question is a maximum of 3.5 inches in its width. 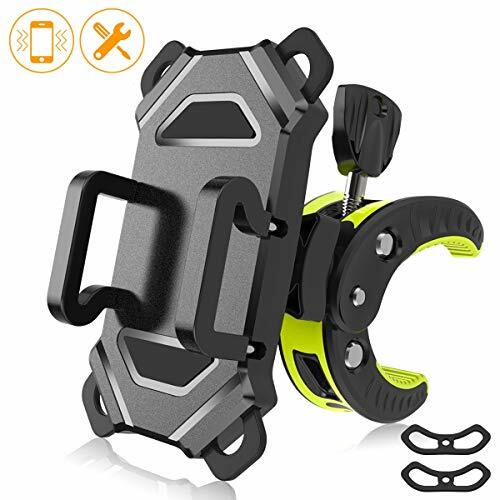 Easily and stable fitting handlebars of 7/8 inches to 1 and 1/14 inches in their diameter, this phone mount adjusts to suit your bike, as long as you do not have a sport bike with clip-on style handlebars. It is very secure with its dual contact points, a co-pilot secure mount made from hard plastic and silicone net which has a very firm grip, and a clamp which is the largest on the market suitable to all handlebar sizes. Sturdy in its structure, it will not break or snap, and it is very strong and durable. The silicone net is able to stretch to quadruple its original size keeping your phone safe as you ride. 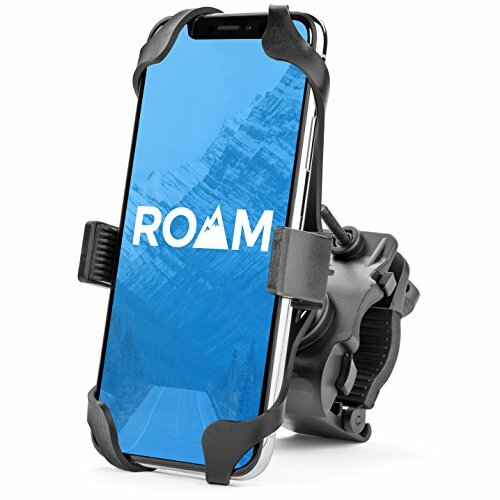 Why We Liked It – We like the Roam Universal Premium Bike Phone Mount because it can be used with any phone and its silicone net adapts in size ensuring your phone is kept safe, secure and harnessed. Supported in all four corners, this bike phone mount clamp ensures complete safety, keeping your phone securely attached to your handlebars throughout your cycle. It’s very stable so you can rest assured that your phone is safe. It has been created through the use of an automatic locking cooperate with a one-way prevent back gear so that even when difficult cycling terrain is encountered, you do not risk losing your phone as it will not be shaken loose. It is very easy to install and requires no tools to do so, you just need to lock the provided nut. This bike phone mount is compatible with any phone between the widths of 3.5 and 6.5 inches, like the iPhone, Samsung, and Huawei. Due to its adaptability, it can also hold a handheld GPS system if they are of preference to you if you purely want to follow routes, maps and increase your safety. Why We Liked It – We like the visnfa Bike Phone Mount Anti Shake and Stable because it is ideal for cyclists who often encounter more challenging terrain but want their phone or GPS device safe and close at hand. Through the use of its dual interchangeable silicone butterfly bands, this bike phone mounts grips and protects your phone to the max, stopping your phone from slipping, sliding or falling in any direction, no matter how challenging your cycle route. Universally compatible, it fits the majority of phones with widths between 2.3 and 3.5 inches, such as the iPhone, Galaxy and the HTC. The clamp itself has soft rubber lines within it to first protect your phone from getting damaged and second to limit any vibrations while cycling. This bicycle phone mount has three settings, two pieces of rubber with five different diameters of installation and has 360-degree rotation abilities. An easy to install phone bike mount, this is ideal for anyone who goes off-roading or crosses country cycling a lot. 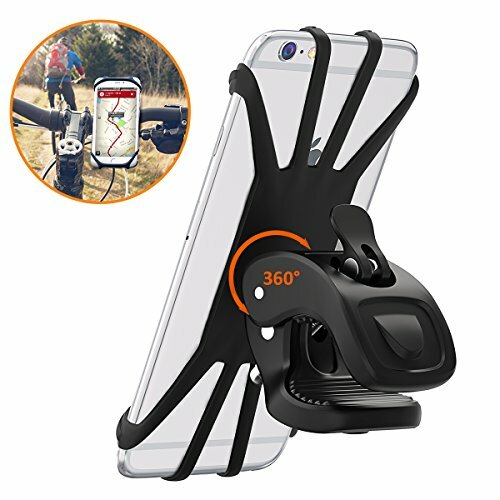 With its vibration reductions capabilities, fierce grip and universal compatibility, this is ideal for the more adventurous cyclists who want their phone within view. Why We Liked It – We like the IPOW Bike Mount, Ipow Universal Cell Phone Bicycle because it reduces vibrations, while gripping phones thoroughly and protects phones as they travel, even on difficult terrain. Created specifically for cyclists who ride frequently on more challenging terrains, this bike phone mount is very rigid, heavy duty and adaptable. It can be used with any smartphone or alternatively with a GoPro if you want to film your ride. This is a very strong phone holder, allowing you to record your fitness, listen to music or use your GPS as you cycle. Ideal for people who cycle long distances, explore new routes, want to listen to music as they ride or need the motivation to continue their training. It has a bar and stem mount, encapsulating any phone or GoPro between the widths or ¾ inch and 2 inches in width. 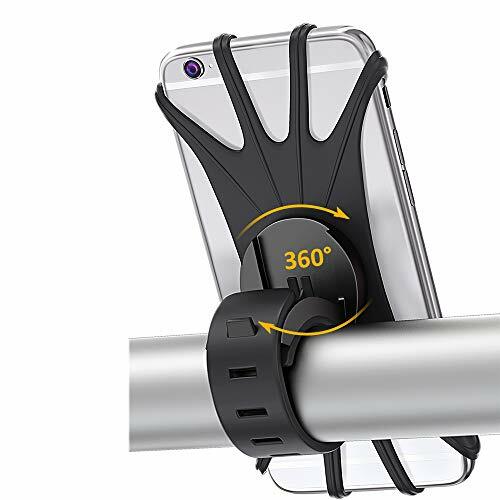 This bike phone mount is ideally suited to Tackform RidePro enabling you to video your journey without the inconvenience of having to stop and start your journey or risking safety by requiring the use of your hands. With a lifetime warranty, this product ensures your satisfaction on every single use. Why We Liked It – We like the Tackform Solutions Bike Phone Holder and GoPro Mount because it is such a heavy-duty, secure and stable bike phone holder, ideally suited to even the roughest of terrains. Innovated from premium silicone, this is a very flexible, adaptable and hardwearing piece of kit. 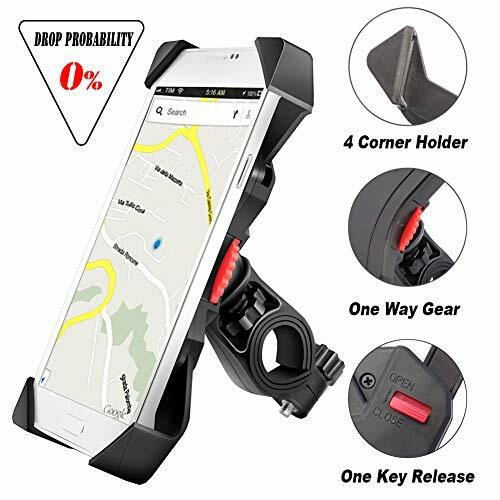 This bike phone holder cradles your phone securely through the use of an anti-shock clamp which also helps to protect the phone from incurring any unintentional damages as you ride. 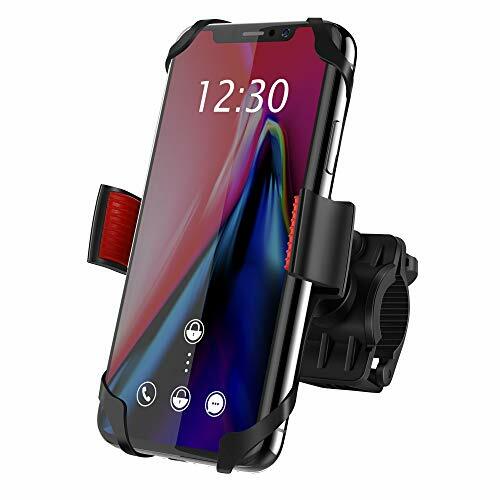 Suitable for universal phone sizes, this phone mount safely holds any phone with a screen of 4 to 6 inches via the extra stretchy elastic silicone bands, holding your phone in place by squeezing it tightly and gripping it hard. It has a 360-degree rotational ability allowing you to create your perfect viewpoint as you’re cycling along. With easy installation, attach it to your bike in the same way as you put a wristwatch on. 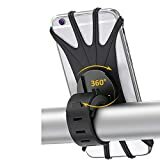 Use this phone bike mount on any size and style of handlebars, ensuring that your hands are kept free at all times, no matter what you want your phone for. Why We Liked It – We like the Bovon Bike Phone Mount, Bovon 360°Rotation Silicone Bicycle Phone because it is so easy to attach and can be used on quite literally any bike with no hassle at all. For a more substantial, powerful and larger bicycle cell mount, why not consider this as an option? With a rubber clip and silicone belt, this metal crow foot clamp has the ultimate grip. It has wrapped bands on all four corners of your phone ensuring that it is kept safe, secure and in the perfect position for you to be able to view any information you require as you cycle. Holding any size of the mobile phone, all trembles and vibrations are prevented with the 360-degree rotation providing the ideal positioning. It has a locking bracket, easily attaches to any handlebars and supports phones up to 3.5 inches. Great for rocky, uneven ground, your phone is held in place by the lock construction. Made from plastic and metal and ensures that all phone aspects can be accessed even when it is in its cradle. The easy mount, easy install capabilities of this phone bike mount mean that there is no inconvenience of tool requirement. Why We Liked It – We like the Sunby Bike Phone Mount, Bicycle Cell Phone Holder because it holds your phone with such incredible grip while enabling you to see and use every inch of your phone screen simultaneously. Use this Stoon bike phone mount to keep your phone close at hand. It has a 360-degree rotation ability and is universally compatible with any type, makes or model of bike. Created from silicone, this bike phone mounts easily clips on to the handlebars of your bike allowing great visibility and is suitable for any phones of 4.7 to 6 inches in their width. Adjust this phone mount so that you can ensure that you are always in control and able to see where you are going clearly if you are using your phone as a GPS system. Ideal for use with iPhones and Androids, this black, simply designed bike mount is just as easy to install as it is to use. Why We Liked It – We like the STOON Bike Phone Mount, 360°Rotatable Universal Bicycle because it is so simple, easy to use and easy to mount, yet so effective in its capabilities to carry, grip and secure your phone. This innovative design enables a phone to be used to its full capacity even when the weather is torrential. 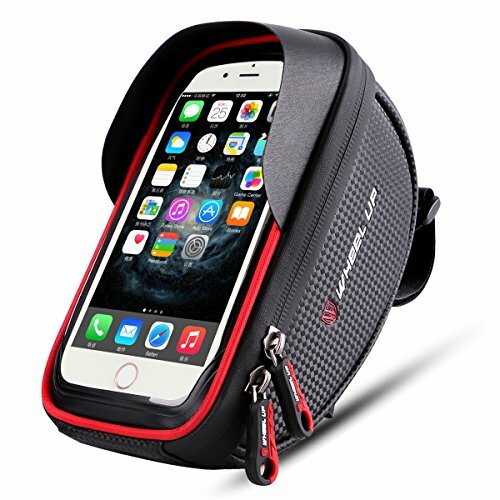 Your phone will not only be safe, but it will also be fully protected from the elements, too, when you choose the Wallfire bike phone mount bag. The bag itself attaches to any size of handlebars and your phone slots into the inside in a visible position with a waterproof touch screen and its very own rain hood. This phone bike mount is suitable for many different phone types, including iPhones and Samsung’s, so long as they are a maximum of 6 inches. This clever phone bike bag mount protects your phone from mud, water damage, and scratches while ensuring that you can use it to its full capacity while you cycle. Why We Liked It – We like the Wallfire Bike Phone Mount Bag because it’s so clever, protects your phone from the elements and has its very own rain hood. Perfect for cycling all year round. Make sure that the bike phone mount you are looking into purchasing is suitable for the phone you own. This is usually stated in its description in one of two ways, often both – either by listing the supporting makes and models or by giving the physical capacities that the mount can hold, usually in inches. If your phone is too small for the mount, it will fall out. If your phone is too big for the mount, you will snap the clip holding it in place. Not all bike phone mounts are usable on all sizes of handlebars. The most common problem bikes for this are sport bikes with adapted or abnormally sized handlebars. If the bike phone mount does not fit your bike properly, your phone is not secure, may get lost and is very susceptible to getting damaged. Be clear as to whether you will solely use your mount for your phone or whether you may want to use it for a GPS as well. If this is the case, then you will want to consider bike phone mounts with large capacities and with silicone, corner bands. This means that either your phone or your GPS will be held properly, safely and securely, and you will be able to use either of them to their full capacity. If you are an all year or all-weather cyclist wishing to take your phone out with you, you may want to consider a waterproof phone mount, like a bike phone mount bag, which is fully waterproof, has a waterproof touch screen and a rain hood. Protect your phone from water, mud and any unintentional damage. 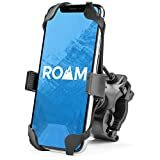 For cyclists who frequently travel on rough terrain, considering bike phone mounts with anti-vibration abilities and firm gripping abilities is an essential requirement so as not to damage, lose or break your phone. Look for mounts with rubber inside their clamps to decrease the vibrations endured by your phone as you challenge yourself going cross country.